Yesterday I came upon a remarkable news.... THE HOBBIT WILL BE PUBLISHED IN LATIN! I came upon the news through the facebook page of The Tolkien Society, which linked to the news of thebookseller.com. 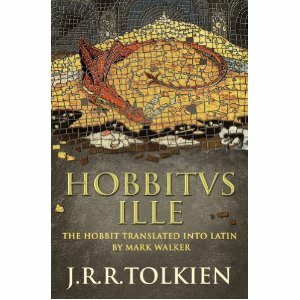 The Hobbit in Latin will bear the title Hobbitus Ille, and will be published by HarperCollins in September 2012, celebrating the 75th anniversary of Bilbo's story. Amazon shows a publication date of September 13th. It will have 320 pages, and a price of 12.99 pounds. The translator is Mark Walker, who has several publications in Latin Language. This is his webpage. It seems the first references of this news were on October 24th 2011, in the tolkienguide.com site. But that post yesterday from thebookseller.com spread the news all over the Tolkien World. While doing some research on further information on this topic, I found a blog called TolkienBritta, which as well has a reference to this news. It seems to be a very interesting blog, hopefully I shall read it throughly, and post an entry about it. Meanwhile, I invite you to have a look. Finally, let me tell you the reason I'm so excited about The Hobbit being translated into Latin: I'm learning Latin at university right now! I did not have the chance to learn latin in high school, like students in other countries, so I'm in the first of six latin courses my carreer (classical philology) takes. So practicing Latin while reading the story of Bilbo, Gandalf and the Thirteen Dwarves..... perfect! The first line of the book has been shared byt HarperCollins: In foramine terrae habitabat hobbitus..... "In a hole in the ground, there lived a hobbit...."
Buenas, sin duda es interesante y me gustaría comprarlo, pero el título me echa para atrás. Yo he hecho tres asignaturas de filología clásica (textos latinos 1, 2 y 3) y he estudiado filología hispánica, y ese "ille" del título me chirría, porque no es artículo en latín, a no ser que lo haya traducido a un latín vulgar del siglo II. Lo cual dudo. Angelus: precisamente ayer (el día en que se publicó el libro, sea casualidad eso o no), en clase de Latín estudiamos el "ille", que como bien sabes, es un pronombre demostrativo, "aquel". "Ille se emplea a menudo con valor enfático para designar personas, cosas, hechos o dichos célebres: Ille Romulus = el glorioso Rómulo." Así que creo que Hobbitus Ille está perfectamente bien utilizado, la inversión de Ille Hobbitus es por un carácter poético, creo yo. Eso me dijeron también un amigo. Si es así, está bien.